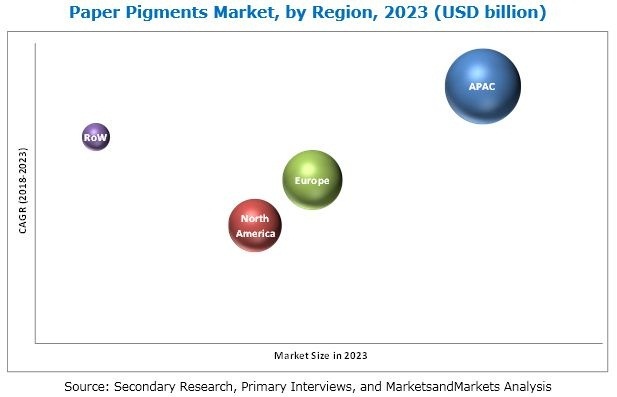 [104 Pages Report] The paper pigments market was valued at USD 12.88 billion in 2017 and is projected to reach USD 17.72 billion by 2023, at a CAGR of 5.6% during the forecast period. Increasing demand for paper from the packaging industry is one of the major drivers for the paper pigments market. The high growth of the packaging industry coupled with increasing regulations related to renewable packaging materials are leading to the increasing use of paper over plastic. This has propelled the consumption of paper in packaging, which in turn, is projected to drive the paper pigments market. The packaging industry is witnessing high growth due to the growing urbanization, demographic changes, rapid growth in emerging economies and technological advancements. The growing environmental concerns have also encouraged the use of paper in the packaging industry. Approximately 30.0% of the packaging industry is currently accounted for by paper. Hence, paper packaging plays a significant role in the packaging industry. The value of the paper packaging industry was approximately USD 65 billion in 2017. This implies that paper pigments are witnessing an increase in demand in the paper packaging industry. The importance of eco-friendly products is increasing in the packaging industry which has led to the use of sustainable and recyclable packaging materials. This has also resulted in a rise in recycling activities in the paper industry, thereby increasing the use of paper in the packaging industry. Moreover, recycling paper saves landfill space, reduces paper waste disposal issues, and helps cater to several environmental concerns. This high growth in the paper packaging industry is driving the demand for paper pigments. This study estimates the size of the paper pigments market for 2018 and projects its growth till 2023. It provides a detailed qualitative and quantitative analysis of the paper pigments market. Secondary sources, such as D&B Hoovers, Bloomberg Business Week, and Factiva, among others, were used to identify and collect information useful for this extensive, commercial study of the paper pigments market. Primary sources, such as experts from related industries and suppliers of paper pigments were interviewed to obtain and verify critical information and assess prospects of the paper pigments market. Key players profiled in the report include Omya (Switzerland), Imerys (France), Minerals Technologies (US), BASF (Germany), Ashapura Group (India), Huber (US), Kemira Oyj (Finland), Chemours (US), Thiele Kaolin Company (US), and KaMin/CADAM (US). The paper pigments market is estimated to be USD 13.52 billion in 2018 and is projected to reach USD 17.72 billion by 2023, at a CAGR of 5.6% from 2018 to 2023. The high demand for paper in emerging countries is leading to the increasing consumption of paper. Despite the increasing use of electronic devices and e-publishing, both, the demand for coated as well as uncoated paper is projected to drive the paper pigments market. Based on type, the paper pigments market has been segmented into calcium carbonate, kaolin, and others. Calcium carbonate is projected to be the largest and the fastest-growing type of paper pigment during the forecast period. The increasing demand for bright and bulk paper is leading to the increasing preference for the use of calcium carbonate over kaolin. Ground Calcium Carbonate (GCC) is the largest type of calcium carbonate paper pigment. It accounted for a share of 70.0% in the global calcium carbonate paper pigments market, in terms of volume, in 2017. The low cost and easy production process of GCC makes it the most widely used type. Precipitated Calcium Carbonate (PCC) is the fastest-growing market as it imparts very high brightness to the paper. Increasing demand for coated paper in future is expected to lead to the increasing penetration of PCC, leading to its high growth rate during the forecast period. Based on application, the paper pigments market has been segmented into coated and uncoated paper. Coated paper is projected to be the largest application of paper pigments during the forecast period. The need for superior quality paper is increasing, offering significant growth potential for coated papers. Moreover, the loading percentage of paper pigments in coating applications is increasing. The use of coated paper is also increasing due to growth of the packaging industry, and hence, is expected to register a higher growth rate. Uncoated paper is also a significant application of paper pigments owing to the high demand for paper pigments for newsprint, writing, and printing paper. Uncoated paper is also expected to witness significant demand in APAC owing to its low cost. The paper pigments market has been studied for Asia Pacific (APAC), North America, Europe, and the Rest of the World. APAC is projected to be the largest and the fastest-growing paper pigments market. The APAC paper pigments industry is experiencing high growth and increasing investments to meet the demand from the paper industry. APAC accounts for half the global demand for paper (48.0% in 2016), driving the demand for paper pigments. Growing industrialization, increasing businesses, and educational institutions in this region are expected to contribute to high demand for paper and in turn, are expected to drive the demand for paper pigments during the forecast period. Paper pigments provide a coating layer on paper which gives uniformity to the paper surface, makes paper whiter, improves opacity, provides the desired finish, imparts printing properties, and improves the shade of the coating. Coated paper has a matte or glossy finish with smoothness and shine. The coating allows the ink to get absorbed into the paper. This creates a cleaner and smoother printing surface, thereby improving the quality of photos and blends. Modern coatings are composed of pigments, binders, additives, and fluid. The papers are subjected to sizing, coating, and calendering to impart adequate smoothness, brightness, gloss, opacity, ink, and receptivity. Coated paper exhibits resistance to dirt and moisture. It also requires less printing ink as it does not absorb the ink. Coated papers are much heavier than uncoated papers. Uncoated paper is more widely used than coated paper. It is less smooth than coated paper and absorbs more ink while printing an image. Uncoated paper is also less expensive than coated paper. It is mainly used for applications such as letterheads, envelopes, and forms used for writing and printing. Paper pigments are used as fillers in the uncoated paper. Fillers are essential in printing papers to increase opacity and brightness, as well as enhance printing properties. The major types of fillers include talc, hydrous kaolin, precipitated silicas and silicates (PSS), and titanium dioxide. The fillers refract and backscatter light through the surface of the paper. The filler paper pigments need to be dispersed evenly through the sheet to increase the optical efficiency. Filler pigments require properties such as a high degree of whiteness, a high index of refraction, small particle size, low solubility in water, low impurities, and low specific gravity. The filler pigments must also be chemically inert to avoid reactions with other chemicals in the paper. Depending on the surface of the paper, uncoated papers are classified as woven, linen, and laid. 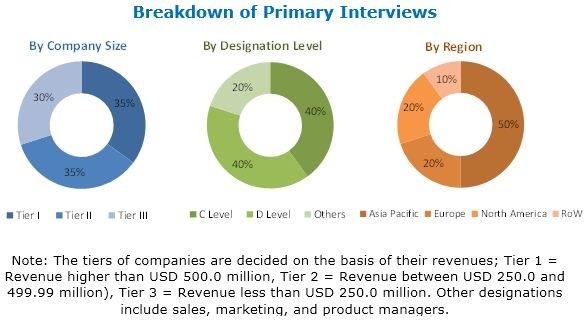 The key factors restraining growth of the paper pigments market are, environmental concerns related to recycling paper and growing digitalization affecting the paper industry. Companies such as Omya (Switzerland), Imerys (France), Minerals Technologies (US), BASF (Germany), Ashapura Group (India), Huber (US), Kemira Oyj (Finland), Chemours (US), Thiele Kaolin Company (US), and KaMin/CADAM (US), have adopted various developmental strategies, such as mergers & acquisitions, agreements, partnerships & joint ventures, and investments & expansions to enhance their footholds in the market.